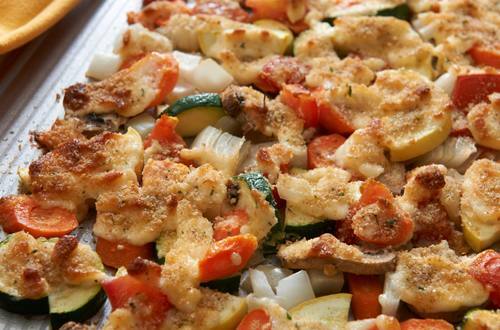 2 Spray baking sheet with no-stick cooking spray, then arrange vegetables in a single layer. 3 Combine Hellmann's® or Best Foods® Real Mayonnaise with cheese in small bowl. Evenly spread mayonnaise mixture over vegetables, then sprinkle with bread crumbs. 4 Bake 15 minutes or until vegetables are tender and golden brown.